Black or African American refers to people having origins in any of the black racial groups of Africa, including those of Caribbean identity. Seventy-nine percent of African Americans had health coverage in 2009 compared to 88 percent of white Americans. A total of 16.6 percent of African Americans aged 18 years and over do not have a regular source of health care. Nearly half (46 percent) of nonelderly black adults who do not have insurance report having one or more chronic health conditions. Thirteen percent of African Americans of all ages report they are in fair or poor health. Adult obesity rates for African Americans are higher than those for whites in nearly every state of the nation—37 percent of men and nearly 50 percent of women are obese. African Americans have higher rates of diabetes, hypertension, and heart disease than other groups. Nearly 15 percent of African Americans have diabetes compared with 8 percent of whites. Asthma prevalence is also highest among blacks. Black children have a 260 percent higher emergency department visit rate, a 250 percent higher hospitalization rate, and a 500 percent higher death rate from asthma compared to white children. African Americans experience higher incidence and mortality rates from many cancers that are amenable to early diagnosis and treatment. African-American adults with cancer are woefully underrepresented in cancer trials and are much less likely to survive prostate cancer, breast cancer, and lung cancer than their white counterparts. Leading causes of death among this group are heart disease, cancer, and stroke. There are 13.24 infant deaths per 1,000 live births in this population. The federal government defines Hispanic or Latino as a person of Mexican, Puerto Rican, Cuban, South or Central American, or other Spanish culture or origin regardless of race. Hispanics are thus a heterogeneous group and may be any race. Sixty-eight percent of Hispanics had health insurance coverage in 2009 compared to 88 percent of white Americans. 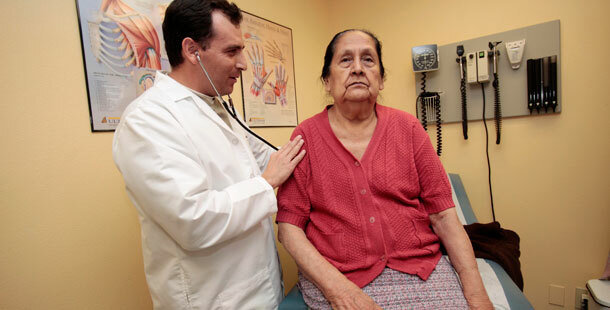 Thirty-five percent of nonelderly uninsured Hispanics report having chronic health conditions. Close to a third of Hispanics lack a usual source of health care and 46 percent of uninsured Hispanics who report having chronic health conditions lack regular care. Ten percent of Hispanics of all ages report they are in fair or poor health. A total of 37.9 percent of Latinos age 20 and over were obese in 2008. Obesity rates were higher in women (43 percent) than men (34.3 percent). Fourteen percent of Hispanics have been diagnosed with diabetes compared with 8 percent of whites. They have higher rates of end-stage renal disease, caused by diabetes, and they are 50 percent more likely to die from diabetes as non-Hispanic whites. Hispanic women contract cervical cancer at twice the rate of white women. One in five Latinos report not seeking medical care due to language barriers. For reasons that are not understood Hispanics live longer than other Americans and have lower rates of infant mortality (5.52 infant deaths per 1,000 live births). Native Hawaiian or Pacific Islander refers to people having origins in any of the original peoples of the Pacific Islands including Polynesian, Micronesian, and Melanesian ancestry. In the 2005 to 2007 period about 80 percent of the Asian, Native Hawaiian, and other Pacific Islanders racial group had health insurance coverage. Given that in the same time frame 83.5 percent of Asians had health insurance coverage, this would suggest that coverage rates for Native Hawaiian and Other Pacific Islanders were less than 80 percent. Eight percent of this population reports it is in poor or fair health. In comparison to other racial and ethnic groups, Native Hawaiians and Pacific Islanders have higher rates of smoking, alcohol consumption, and obesity. This group also has little access to cancer prevention and control programs. The state of Hawaii found that the diabetes rate for Native Hawaiians was twice that of the white population. Native Hawaiians are also more than 5.7 times as likely as whites living in Hawaii to die from diabetes. Native Hawaiians and Pacific Islanders are 30 percent more likely to be diagnosed with cancer compared to non-Hispanic whites. The infant mortality rate for Native Hawaiians is 9.6 per 1000 live births, which is 1.7 times greater than non-Hispanic whites. American Indian or Alaska Native refers to people having origins in any of the original peoples of North and South America (including Central America) who maintain tribal affiliation or community attachment. About 68 percent of American Indians and Alaskan Natives under 65 years of age had health insurance in the 2005 to 2007 period. The prevalence of overweight and obesity in American Indian and Alaska Native preschoolers, school-aged children, and adults is higher than that for any other population group. Thirty-one percent of men and 26 percent of women aged 18 years and over in this population smoke. American Indian and Alaska Native adults were 2.1 times as likely as white adults to be diagnosed with diabetes. They were almost twice as likely as non-Hispanic whites to die from diabetes in 2006. In general, American Indian and Alaska Native adults are 60 percent more likely to have a stroke than their white adult counterparts and American Indian and Alaska Native women have twice the rate of stroke than white women. Suicide is the eighth leading cause of death for American Indians and Alaska Natives. It is the second leading cause of death for those age 10 to 34 years. When compared to other racial and ethnic groups, American Indian and Alaska Native youth have more serious mental health problems such as depression, anxiety, and substance abuse. There are 8.28 infant deaths per 1,000 live births in this population group. American Indian and Alaska Native infants are 3.7 times as likely as white infants to have mothers who began prenatal care in the third trimester or did not receive prenatal care at all. This racial group is defined as people having origins in any of the original peoples of eastern Eurasia, Southeast Asia, or the Indian subcontinent. Asian Americans represent both extremes of socioeconomic and health indices. 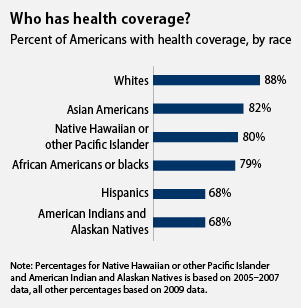 About 82 percent of Asian Americans had health insurance coverage in 2009 compared to 88 percent of white Americans. Obesity is not generally a problem in this group. In fact, about 1 in 10 Vietnamese and Korean adults are underweight. Asian Americans suffer disproportionately from certain types of cancer, tuberculosis, and Hepatitis B. Vietnamese-American women, for example, have cervical cancer rates five times those of white women. Southeast Asian refugees are at significant risk for posttraumatic stress disorder associated with trauma experienced before and after immigration to the United States. There are significant variations in infant mortality among subgroups of Asian Americans that are not readily explained by known risk factors.